Staying at BYH Brighton is an alternative to staying at the Brighton Language School itself and it is a very different and independent option compared to the host family arrangement. At BYH Brighton we provide overseas students with the opportunity to integrate with other nationalities in shared dormitory style rooms. Rooms of different sizes, some with ensuite (some without) and it provides students with a great opportunity to practise their language skills. 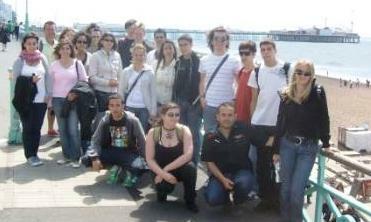 We are located only streets away from Brighton's & Hove's Language Schools & Centres. BYH support a clean, functional, fun and safe shared environment. There are laundry facilities, lockers and a bike store. Including generous self catering facilities. Breakfast is not included. Ideal for exploring the Brighton & Hove seafront, the city centre the South Downs National Park and beyond. Our doorstep is the beachfront and we also have a garden. Comfortable rooms, offering fresh linen and most rooms are ensuite. Towels are extra. We know Brighton. Download our BYH guide to Brighton which includes all our favourites. Give BYH a call soon and find out what rates we can offer you for a medium to long term arrangement.